After we arrived in Martinique, we managed to fix the little damages of Leonora quite quick. New wood on the rail and a new block were installed and the main was quickly fixed by the sailmaker in Martinique. So, let’s enjoy the Caribbean and go North before heading south again. That’s what we thought. The first trip was to Grand Anse, which is very beautiful. We dropped the anchor and got the dinghy ready to go to the beach and then …. we heard a noise. It turned out another boat’s anchor went on slip and the boat hit us! True is that it was quite windy, so we could not really blame the one-handed skipper. Unfortunately, the boat bended our pulpit in a manner that we had to spend 5 weeks in Le Marin until the “specialists” there could fix the wood, a bit of gel coat, the pulpit and the genua forestay. In Le Marin we went to our first dinghy party: Seacircus does cabaret on the water. Very nice show – very french! After everything was fixed we made our way to St. Lucia, first to Rodney Bay and now in Marigot Bay. In Rodney Bay we stayed a couple of days in front of Pigeon Island, which is worth a visit. Before continuing to Marigot bay, we had to do a quick lift out to change the propeller. When leaving Le Marin we catched a rope in the Marina, most probably a genua sheet which someone lost at the repair dock. Fortunately, Leonora came with its original fixed prop, so the it was no big deal to change it. The guys at Rodney Bay where super helpful and pragmatic. We also had a car to explore the island. Especially the day that we spend with our friend of Knot Vikings was great. Chris, Steffi and their little son Leo love filming, and it was exiting to see the island filmed by their drone! We also used the time in Rodney bay to do 8 dives and complete the next level (Advanced Open Water). Dive Saint Lucia is run by Marcel from Switzerland. He has built up a great team and has fantastic infrastructure and equipment. 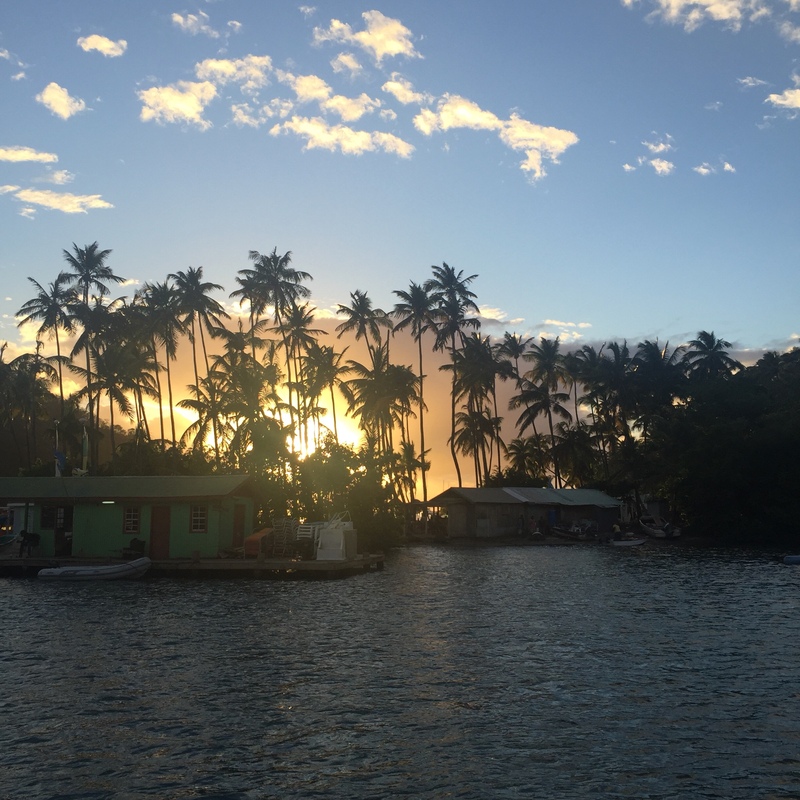 During the days that we spent on the diving boat, we realized that the next destinations should be Marigot Bay and the Pitons. We have been in Marigot Bay for 4 days now and will head towards Bequia. We are not sure if we stop at the Pitons. Sieht von Post to Post cooler aus. great adventure, you are overcoming, I love the stories and adventures lived and told by you, miss you very much, but the experiences that you are having is undoubtedly extraordinary. I am very proud to be somehow part of your life story. A felicidade de vocês na foto acima, deu pra perceber o quanto está sendo extraordinário essa aventura! E que sereia linda o Chris pescou! Aproveite e estou ansiosa pra pra rever vocês em agosto! Inveja dessa pele linda, bronzeada e iluminada!